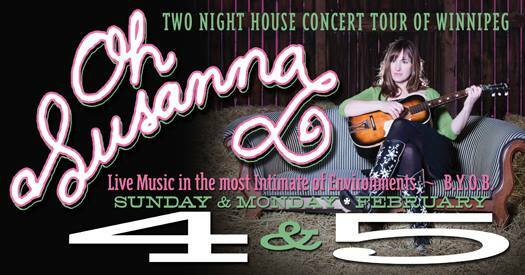 Home→Blog→Concerts→Oh Susanna @ The Sunset Saloon, Feb. 4! Advance tickets are available (and encouraged!) Fill out the contact form at the bottom of the page to get your hands on some. They make GREAT Christmas gifts! The Sunset Saloon is a house concert venue in Westwood (near the YMCA on Portage.) We’re open to all. Feel free to pass along the event info, bring friends, bring your kids (our kids will thank you), or just come by yourself and make some new friends! Admission is by donation, which goes directly to the artists. Most of the folks who play at The Sunset Saloon just happen to be passing through town and are in need of a welcoming place to play. On rare occasions, we reach out to our favourites in hopes that they might consider making the trek to Winnipeg just to play for us. The latter is the case with this show, featuring one of the country’s finest songwriters and an amazingly intriguing performer. She also happens to be a real sweetheart and a longtime friend. Suzie is special all-around, and it’s a rare treat to see her in an intimate house concert environment. You can catch Oh Susanna pretty regularly in town playing festivals and bigger stages, but up close and personal is definitely the way to go. Her thoughtful, detailed, powerful songs are best experienced in a quiet, comfortable room full of like-minded folks ready to be swept away. This will be a special night, and one that you do not want to miss! Of course, it helps that Suzie is touring on the strength of one of the most acclaimed and amazing releases of 2017. Already she’s been nominated for has earned three Canadian Folk Music Award nominations: English Songwriter of the Year, Contemporary Singer of the Year, and Producer of the Year.